It is good to hear recently that the Chinese Lunar Rover has finally landed on the Lunar surface. Although a past article of mine has dismissed the good reason for exploring our Moon, it does (I admit) excite me. Maybe this is because the great American/Russian Space Race in the 60’s took over the entire worlds space enthusiasts and general public attention over a mere decade. This China project really was commercially and economically sound to send a machine up before any decision is taken to return with us mere human species. It speaks in my opinion of a Nation who has the money to do it , but has perhaps restrained itself in throwing money yet into, (let’s be honest an unknown amount of currency and possible public offence in doing it) Not only that, but a vast area of the countries in this World that we live in folks fall into the following categories …Bankrupt, Near Bankrupt, Believe they are not Bankrupt, but in reality are, Not bankrupt yet, but living the dream as if it will pass them by, and finally, More than enough in the Government Bank, yet poverty in those countries appears wide-spread. Americans themselves would have known that the Billions of dollars invested into a potential eight or more Moon landings , which turned into a successful six, could have cost a lot of political heads what with Vietnam going on at the same time. But the Lunar Surface shines out like a welcoming beacon to us every night somewhere throughout the world we live in, Perhaps it is this shining light that we all need to balance the tides etc of our small Earth is just what makes it universally lived. After all, trying to get somewhere which seems impossible certainly has an appeal to our natural curiosity. Scientists, biologists , astronomers, physics and engineering boffins through the ages have all pushed the boundaries that reveal so much to mankind. We do like a challenge or two, or in the case of NASA it us more like six or seven if we take our minds back to each major space travel project..Mercury, Gemini, Apollo, Apollo Soyuz Test Project,International Space Station, Shuttle, Mars, and many other sideline ventures. One important thing from all this recent research and venture back to the moon that has come to potentially positive light is this..A NASA orbiting probe designed for the moon has revealed that most of the early flags planted by astronauts on those early missions in are still flying. Wow! this apparently is despite scientists predicting they would not be able to survive what they call extreme temperatures and radiation over a period of many years. 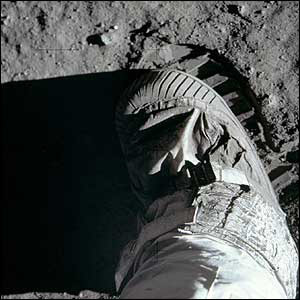 I already predict the usual sound of Apollo 11 moon landing conspiracy folks shoes now becoming more like softer slippers perhaps ? However as. this is an American probe pinpointing these flags it might just Herald those who never believed Neil and Buzz walked on the moon for the first time in 1969 to stand firm in their original beliefs. Either way, it ain’t gonna change my mind one tiny bit, Apollo 11 flag photographed flying or not! Please let’s not insult the memory of Neil Armstrong’s achievement any more. Let us also too, not insult both those other two surviving brave astronauts, Buzz Aldrin and Michael Collins.It also casts doubt on five other successful missions and one near tragic other (Apollo 13). Neil Armstrong, all American hero, Navy, Pilot, Test Pilot, X15 Test Pilot, Astronaut and first human being to leave a footprint on the surface of the Moon. Looking back at Armstrong’s lengthy and successful career it is not surprising at all that he was chosen for the most famous aviation mission ever planned. His love of enginering technology and of course flying some of the fastest aircraft known to man set the path for a long decade of planning towards the Moon. Missions Mercury and Gemini were training grounds for Astronauts like Armstrong allowing them to demonstrate that they really did have the right stuff for the work ahead. Astronaut training for Armstrong would have been gruelling even for a man of his giftings, it was certainly not for the faint hearted. Astronauts of that era gave themselves little over 50 % chance of returning from a mission for the simple reason that their training was to aim for something so audacious that had never been achieved before. NASA soon recognised his talent, cool character and tenacity that would be needed after the 1967 Apollo 1 training tragedy which cost Gus Grissom , Roger Chaffee and Ed White their lives .NASA had found a new man to take that first step on the Lunar surface! A sturdy talented group of Astronauts were trained to pave the way towards the Moon with Apollo’s 7-10 taking them on daring missions that would test every single technical requirement to get two men on to the Moon’s surface. Armstrong was fortunate that his crew included Michael Collins and Buzz Aldrin, both men of exceptional quality for the job. Not only did they need to reach the Moon , they had to rely on one man (Michael Collins ) to get them back. These past solo pilots now had to take team work to a whole new level. Armstrong…“270 (feet) .Okay, hows the fuel? A brief conversation lasting several minutes reminds us of the importance of all those inspired declarations that were made by those involved with The Lunar project. We must remember that ” Imagination is nutritious food to every visionaries appetite”. Armstrong , Aldrin and Collins each had to have a strong appetite for imagination, for what they dreamt whilst growing up would surely hold them firm over several decades that would follow. There is in my opinion nothing better than a focused imagination, a hunger for hard work, a powerful ear to listen, and a brave instinct to make decisions at the most vital of times. Faith in other people is a wonderful gift, that enables ground breaking events to take place. When it all comes together successfully, it is surprisingly so, not the time then to take a breather and relax. Over 10 years of success, failure, hard toil, sacrifice and even fear had been with Armstrong Aldrin and Collins during the Apollo Lunar build-up. Walking on the Lunar surface is more than just a statement of “We made it to the Moon”, it should inspire each of us all to believe that the things we dream about can actually happen. Neil Armstrong when he began walking down the ladder of the Lunar Module to take those famous first steps speaks these words to Cap Com. “I’m at the foot of the ladder. The LM fooftpads are only depressed in the surface about one or two inches although the surface appears to be very, very fine grained as you get close to it. Its almost like a powder. The ground mass is very fine. I’m going to step of the LM now”. Now he would have to get himself ready for those first Lunar surface words, ” That’s one small step for man;one giant leap for mankind”. Having got to his “Great gig in the sky” he goes on to say: “The surface is fine and powdery, I can kick it up loosely with my toe. It does adhere in fine layers, like powdered charcoal, to the sole and sides of my boot. I only go in a small fraction of an inch, maybe an eighth of an inch, but I can see the footprints of my boots and the treads in the fine sandy particles” . So we see that his footprint stamped on the Moon for all eternity signifies almost a statement of man’s permanency on that desolute lonely planet. It was indeed a giant step for mankind for back and forth we would go for another five missions stamping our claim on a planet that cannot give us anything back in return, except for the knowledge that we gained in getting there. So Mr Armstrong I salute you for reminding us that its part of our human make-up to dream, to have visions and goals that though sometimes they may seem way out of this planet, they are actually very close to the hearts of all mankind. The message would banish Collins’s deepest fear: that he would be the only survivor of an Apollo 11 disaster and that he was destined to return on his own to the United States as “a marked man”.The realisation that the normally icy-cool astronaut was so obsessed by such an outcome puts a fresh perspective on the celebrations that will, this weekend, absorb the United States as it commemorates the moment, on 21 July 1969, that an American first walked on another world. Apollo 11 will be presented as a flawless technological triumph at jamborees across the nation, including a special reception at the National Air and Space Museum in Washington, which all three Apollo 11 astronauts are scheduled to attend. Yet at the time, worries that the mission would end in disaster consumed nearly all of those involved in the programme - despite their apparent calm. And no one was more stressed than Collins, it appears. In his case, the astronaut was obsessed with the reliability of the ascent engine of Armstrong and Aldrin’s lander, Eagle. It had never been fired on the Moon’s surface before and many astronauts had serious doubts about its reliability. Should the engine fail to ignite, Armstrong and Aldrin would be stranded on the Moon - where they would die when their oxygen ran out. Or if it failed to burn for at least seven minutes, then the two astronauts would either crash back on to the Moon or be stranded in low orbit around it, beyond the reach of Collins in his mothership, Columbia. All three astronauts believed there was a real chance such a disaster would occur. Armstrong thought his prospects were only 50-50 of making it back to Earth. And so did Collins, the pilot of Columbia and one of the world’s most experienced aviators. Thus Collins - alone in Columbia as the world focused on Armstrong and Aldrin walking on the lunar surface - fretted about his two companions below him on the Moon and revealed, in a note written at the time, that he was now “sweating like a nervous bride” as he waited to hear from the Eagle. Then Armstrong and Aldrin prepared their lander for its launch. Armstrong pressed the engine’s firing button and Eagle soared perfectly above the lunar surface towards the waiting Collins. His worst fear had not materialised and he returned safely to Earth in the company of Armstrong and Aldrin, unmarked by the experience. He would not suffer a fate of global notoriety. In fact, the opposite happened. Collins was forgotten. Today most people still know the names of the two first men on the Moon and recall the words, delivered by Armstrong, about taking a giant leap for mankind. But the name Michael Collins is rarely recalled, despite his critical role in the historic flight of Apollo 11. Not that he holds grudges. “It was an honour,” he said last week. In fact, he was - in many ways - the unsung hero of the Apollo 11 mission, a point that was underlined at the time by the great American aviator Charles Lindbergh. He wrote to Collins, not long after his safe return, to tell him that his part of the mission was one of “greater profundity … you have experienced an aloneness unknown to man before”. It is an intriguing remark and an apposite one, it turns out - a point that can be appreciated by looking at the very set-up of the mission. Apollo 11 consisted of a spindly lunar lander, Eagle, and an orbiting mothership, Columbia, that were both blasted into space on a giant Saturn V rocket on 16 July 1969. For three days, Armstrong, Aldrin and Collins cruised towards the Moon inside Columbia and spent their time gazing “out the window at the Earth getting smaller and smaller and checking the spacecraft”, according to Aldrin. Then, on 20 July, Armstrong and Aldrin crawled into Eagle and flew it down to the Moon’s surface. “Keep talking to me, guys,” radioed an initially panicky Collins as the pair drifted away from his ship. Minutes later, Columbia swept behind the Moon and Collins became Earth’s most distant solo traveller, separated from the rest of humanity by 250,000 miles of space and by the bulk of the Moon, which blocked all radio transmissions to and from mission control. He was out of sight and out of contact with his home planet. “I am now truly alone and absolutely alone from any known life. I am it,” he wrote in his capsule. Lindbergh’s remarks were certainly accurate. Such solitude would have unnerved most people. But not Collins. He says the emotion that he experienced most during his day alone in lunar orbit was that of exultation. And certainly he appears to have relished his time as the loneliest member of his species. He also emerged from the post-Apollo years relatively unscathed. 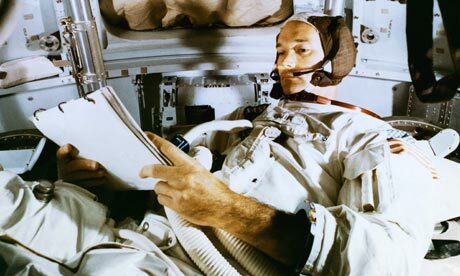 Aldrin lapsed into alcoholism and depression, while Armstrong became a virtual recluse. Both men subsequently divorced. By contrast, Collins - shaded from the glare of publicity - has avoided such personal traumas and is still with his wife, Patricia, whom he married in 1958. The couple have three grown-up children. Collins was born in Rome on 31 October 1930. His father, Major-General James Lawton Collins, was then serving overseas with the US army. Collins later graduated from West Point and joined the US air force. An early assignment was to the 21st Fighter-Bomber Wing at George Air Force Base, where he learned how to drop nuclear weapons. He joined the astronaut corps in 1962 and flew on one of America’s two-man Gemini capsules with veteran astronaut John Young, who flew on a later Apollo mission. Then came his selection for Apollo 11. After his return to Earth, Collins gave up space travel and pursued a career in bureaucracy and business. He was director of the National Air and Space Museum until 1978, before being appointed vice-president of LTV Aerospace in Arlington, Virginia. He resigned in 1985 to start his own business. He describes himself today as moderately busy, “running, biking, swimming, fishing, painting, cooking, reading, worrying about the stock market and searching for a really good bottle of cabernet for under $10″. As to his claim to fame, that was simple fate, he added. “Neil Armstrong was born in 1930. Buzz Aldrin was born in 1930, and Mike Collins, 1930. We came along at exactly the right time. We survived hazardous careers and were successful in them. Why would we go to the Moon again ? I found it interesting to read the recent comments of an American presidential candidate talking on his views to re-visiting the Moon. For someone who may be confident about his chances of becoming the next President has he forgotten the World (in particular America) is still in deep recession. And whilst I myself am a space travel enthusiast I do recall that America has already stepped up to that challenge, been there ! and brought back some space rock samples already on six separate occasions. Not only that Space Shuttle has come to an end, job losses have been made at NASA and Astronauts are looking to use their skills elsewhere ! Or have I missed something ? Whilst we have the technology to get there faster and safer than before, it is 40 years since man traveled into deep space opting for more regular excursions via Space Shuttle. Any project to revisit the Lunar surface does not have to involve America unless it is for a particular purpose and justification of budget. Other countries such as China who have hinted this may be a possibility for them would of course create another huge public interest in space exploration. I for one would love to see more deep space travel to further planets, but not to the Moon as a first choice. The Moon would have to serve a purpose for long term trips with a permanent base for study purposes. Think about the cost of getting Apollo 11 to the moon? It took three space programs of research , Mercury, Gemini and Apollo which gave Neil Armstrong and Buzz Aldrin only 2 hours 31 minutes on the lunar surface traversing the surface by 250 metres collecting 21.7 kilograms of rock. As a small child like many children I would now and again on a star lit night stand day dreaming focused on my own personal star with my hands outstretched trying to grab it. I remember vividly the year of 1969 when in one single minute taking ten years of preparation Neil Armstrong gave hope to many young men and women who dreamed of becoming space explorers.It is always good to dream rather than fantasize! Dreams can become visions , visions with perseverance can becomes realities, but fantasies often remain just that because they lack substance. The year 1961 recognises mankinds first achievement of successfully sending a man into space. Cosmonaut services pilot Yuri Gagarin the favoured candidate out of a possible 20 stepped on board his Russian Vostok 3KA rocket that would see him become the first man in space. The Americans decision to test trial an earlier space flight using a monkey enabled Russia to take the lead over them. We know that his spaceflight consisted of a single orbit of the Earth with official records telling us the spaceflight took 108 minutes from launch to landing. It was part of the mission that Gagarin would land separately from his spacecraft by ejecting with a parachute 7 km (23,000 ft) above ground. Gagarin was in the spacecraft for 108 minutes after launch, and that he didn’t touch ground for another 10 minutes. These statistics are essential in proving that Gagarin completed a full 360-degree orbit in inertial space. The longitude of launch to landing spanned a little more than 340 degrees, but the Earth also was rotating underneath him at about 15 degrees per hour while Gagarin was aloft. This historic flight catapulted him to fame and National hero status, immortalised after tragically being killed flying a Russian MIG fighter aircraft in 1968. On a clear July day thousands gather to witness the final launch of NASA’s only manned spacecraft known to us as The Space Shuttle. As countdown concluded the sky was lit with blistering flames coming from the launch rocket thrusters that would propel it into orbit. As it disengaged itself from the launch pad memories of those early space exploration missions from Mercury to Apollo would know doubt be in the hearts of the Astronauts as they set the sights for the International Space Station. As the Shuttle reached remarkable heights in a matter of seconds separating the clouds and showing off a white trail behind itself, nothing else in aviation today quite compares with this technological achievement. Though not a deep space spacecraft its resilience shone through for 30 years, and it is poignant to remember the astronauts who lost their lives in the two disasters which NASA suffered. Aviation has now lost in the last 10 years two significant aircraft in Concorde and Space Shuttle with no replacements. Both America and Russia since the late 1950’s have paved the way in space exploration leaving perhaps another Nation to take up the mantel? Both nations have successfully seduced their countries into supporting their audaciously expensive long term space programs. Competition between the two superpowers saw Russian military pilot Yuri Gagarin become the first man in space, and Naval pilot Neil Armstrong become the first human to walk on the surface of the Moon. As for the future I doubt if there will be any future space programs which will achieve , or touch the hearts like these two. It is not just proving that these goals can be achieved it is encouraging mankind that dreams can be fulfiilled no matter how far fetched they may appear when the vision is given. Technology will always advance beyond our imagination inspiring those who are gifted to work at their visions and hold them firmly in their hearts without fear of rejection. I will always applaud the risk takers,those who pledged the money, those who sacrificed the time for the invention of new technology, those who risked their lives as pilots and crew to achieve successful missions into new unexplored territories. Good to welcome you all back to my historical website. Firstly I would like to thank all past, present and future visitors for your keen interest and hopefully patience in reading some of my articles. It will always in my opinion be a touch of historical sadness when any successful technology ceases not to be replaced and streamlined through with even more challenging technology as we see the Space Shuttle certainly earnt its’ reputation for! As STS 133 prepares its launch at end of January 2011 for the International Space Station(ISS) visit, it looks like America’s Shuttle will lose its status of the world’s most successful and practical deep space aircraft. For it has been decided by the top brass in view of the work still continuing on board the ISS there will be neccessary flights of a further two last shuttles scheduled as STS 134, and STS 135 (Atlantis) being the very last Shuttle numbered flight. mission. On a pre planned day on July 8th 2011 will no doubt be seen as a very special and significant date time in space history. We see this cessation of technology occassionally happening in aviation, with the most famous embarressment ‘ The Concorde’ being scrapped without a worthy replacement. Or to put it another way a failure to upgrade on what was a dateless, technically genious aviational masterpiece.The Concorde an Anglo British success began its early designs way back in the 60’s when Great Britain was coming out from its swinging 60’s Beatles pop arena into an era of more darker heavy rock music leading the way. Thus the Concorde itself was an innovator proving most definately that people would pay a good price for maybe not the most comfortable ride in the world, but ceratainly the fastest. I compare it to the Space Shuttle as they seemed to have similar goals, of excellence in engineering, severe testing before trusting regular flights and the ability to get you somewhere either inside , or outside the Earths atmosphere quickly whilst bringing you back home safe! Space Shuttle did exactly what it set out to do. It shuttles highly trained experienced pilots , navigators and non flying technical personnel into space and back. Rewinding back to the late 60’s and early 70’s NASA were using the Mercury, Gemini, and Apollo programs to justify a more competitive priced semi commercial project that involved more low profile individuals, ie highly trained mission specialists. Early space astronauts rightly earned their celebrity status, for their incredible bravado, excellent previous military record , and their ability to work and respect those who made it happen on the ground. It was this relationship (with the exception of two tragic Shuttle disasters) that gave in my opinion the Space shuttle an extremely long record of achievement. From 1980 after the 1st test flight with of STS 1 with Apollo Astronauts John Young, and new Rookie Bob Crippen we see experience giving new blood great encouragement. Only but a very few number of Apollo and Pre Apollo Astronauts were chosen, or applied for the Shuttle crew jobs. Harrison Schmitt the first non military aviator, and first ever mission specialist was chosen to go up on the last Apollo mission (17) for a purpose. He may of been possibly unpopular with the ‘in crowd of NASA Astronauts’ at the time when chosen (around 1970) but NASA in my opinion were thinking much much further into the future by connecting and enabling everyday people to get involved in Space Travel. Apollo, A legacy not to be forgotten..
After training as a Navy pilot, working as a test pilot, being hand picked for the prestigious X15 project, and finally getting handpicked for NASA, his words are really very down to Earth. They show I think a touch of trepidation, a healthy fear of the unknown, and a man who must be in total “awe” of the whole situation. Now he would have to get himself ready for those first Lunar surface words, ” That’s one small step for man;one giant leap for mankind”. Having got to his “Great gig in the sky” he goes on to say: “The surface is fine and powdery, I can kick it up loosely with my toe. It does adhere in fine layers, like powdered charcoal, to the sole and sides of my boot. I only go in a small fraction of an inch, maybe an eighth of an inch, but I can see the footprints of my boots and the treads in the fine sandy particles” . So we see that his footprint stamped on the Moon for all eternity signifies almost a statement of man’s permanentcy on that desolute lonely planet. It was indeed a giant step for mankind for back and forth we would go for another five missions stamping our claim on a planet that cannot give us anything back in return, except for the knowledge that we gained in getting there. So Mr Armstrong, Mr Aldrin and Mr Collins I salute you for reminding us that its part of our human make-up to dream, to have visions and goals that though sometimes they may seem way out of this planet, they are actually very close to the hearts of all mankind. Copyright Gary Cole. Designed by Lilian Tula and Rachael Furn.